Notes | Eisenstaedt and colleagues like Carl Mydans, Andreas Feininger, Cornell Capa, Gordon Parks, Dmitri Kessel, and thirty-eight other Life photographers interviewed here were practicing journalism in fact, but the results often turned out to be art. In one hundred hours of taped conversations, they confided their ambitions, anxieties, and accomplishments to their friend and peer John Loengard, Life's most distinguished contemporary photo essayist. These real-life stories of the adventures and mishaps of staff photographers - from World War II in Europe and the Pacific to the tumultuous events of the 1950s through the 197Os - delineate the golden era of photojournalism. Comments | [01/04/04] A great inside look into the photographers and their personalities. If you like this book then you will also like Magnum: The story of the legendary photo agency, by Russell Miller. Comments | [12/18/03] This book is a great read. I went through it in just a few days, enjoying it as good reading and a photo history lesson. There are quite a few famous photos presented in the book as well. Comments | [06/20/03] I thought the book was an excellent collaberation of stories and images that covered the course of an entire publications history. 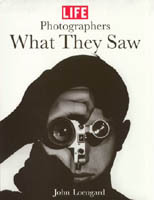 Offering insight and knowledge of all the famous photographers to pass through LIFE. A worth while read. Comments | [12/26/02] This is a book that I enjoy rereading. The stories are wondering and full of helpful tips. I think that it is helpful for all photographers to read about the life stories of those that have gone before us. Comments | [10/05/02] On my bookshelf next to “Life Photographers: What They Saw” is “Get the Picture” by John G. Morris, written by the man whose resume includes: first executive editor of Magnum Photos and picture editor at both The Washington Post and The New York Times; all of which followed his stint as a picture editor in London for Life during W.W.II. “Get the Picture” is a must read for anyone even remotely interested in picture editing. Written in a vivid and accessible style the book is part twentieth century photojournalism history and a manual in the evolution of picture editing. Add to this a historic cast of characters both from photography and world events, and this book becomes an enthralling read.